Law enforcement and fire inspectors will be fanning out across the Las Vegas Valley this year to crack down on the use of illegal fireworks. Anyone caught using illegal fireworks faces fines up to $1,000 and 6 months in jail. An estimated 11,100 people were treated for fireworks injuries in the United States in 2016. Law enforcement and fire inspectors will be fanning out across the Las Vegas Valley this year to crack down on the use of illegal fireworks. Those caught face fines of up to $1,000 (and 6 months in jail) and disposal fees may apply. Fireworks were responsible for an estimated 11,100 injuries treated in U.S. hospitals in 2016, the most recent year statistics were available. Children younger than 15 years of age make up almost one-third (31 percent) of the injuries. It is estimated that local fire departments respond to 50,000+ fires caused by fireworks each year. Fireworks noise scares pets and can be disturbing to veterans and those suffering from post-traumatic stress syndrome. Additionally, fireworks pollute our air. It's time that we put an end to the proliferation of illegal fireworks. 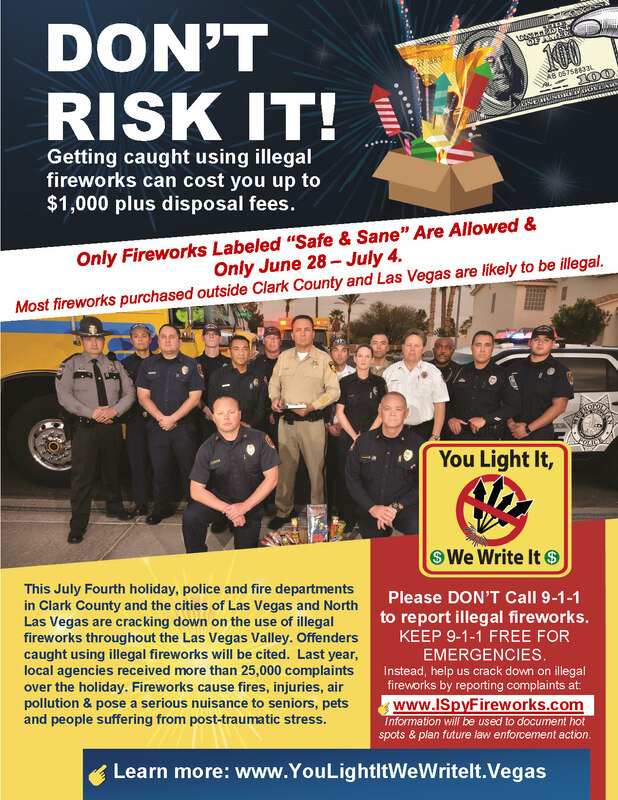 If you're thinking of driving to our neighboring communities to buy non-safe and sane fireworks so that you can set them off in Greater Las Vegas and Clark County, don't! And remember: You Light It, We Write It! If you're tired of the illegal fireworks and want to help us stop their use, please tell your neighbors about this new effort. Show them this website. Disseminate our fliers. Share our content on Facebook, Instagram, Twitter and other social media using the hashgtag #YouLightItWeWriteIt. Together, we can put an end to proliferation of illegal fireworks and hopefully put an end to the injuries and fires. Fireworks were responsible for an estimated 11,100 injuries treated in U.S. hospitals in 2016, the most recent year statistics were available. There also were an average of 7.1 reports of fireworks-related deaths annually over the last 15 years, according to the United State Consumer Product Safety Commission (CPSC). Children younger than 15 years of age make up for almost one-third (31 percent) of the injuries. Sixty-nine percent of the injuries were burns. One-third of the injuries were to hands and fingers. Twenty-percent of the time the injuries were to the head, face and ears, 18 percent of the time the legs were injured, and 12 percent of the time it was the trunk of the body that was injured. Eyes were injured in 9 percent of the cases. Residents are urged NOT to call 9-1-1 or 3-1-1 to report illegal fireworks. It’s important that we keep these telephone lines clear for life-threatening and other emergencies. Instead, residents will be urged to visit ISpyFireworks.com and report the location of the illegal fireworks. The information reported will help law enforcement document areas where illegal fireworks are being ignited for future enforcement action. When illegal fireworks are ignited, it will be easy enough for police and fire to see for themselves where the fireworks are coming from and respond accordingly. This is a community problem and we appreciate your support.